We still have on our eyes the Men’s 400m World Record by Wayde Van Niekerk, but we don’t even have the time to breath that the men’s 100m finalists enters the track. 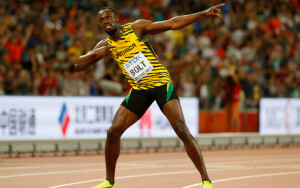 Usain Bolt presents himself on the blocks after a semifinal ran in 9″86; at Justin Gatlin‘s entrance spectators started booing, saving the opposite reaction to Usain Bolt. Justin Gatlin makes a good starts, puttin immediately himself in the first position, but he can do nothing but watch Bolt coming from behind overcoming him and cutting the finish line in 9″80 winning his third Olympics in a row. Second place for Gatlin in 9″89 but the bronze medal goes to the young canadian Andre De Grasse with 9″91. Bolt brought home his first gold from Rio 2016, now we need to wait 200m and the 4x100m relay to see if he manages to make the third triple in a row.